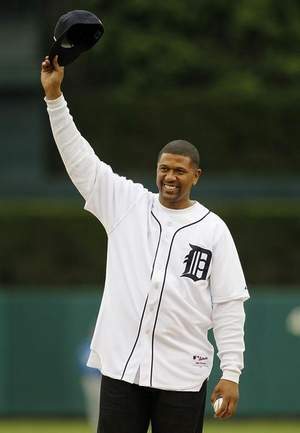 Member of Michigan’s Fab Five Jalen Rose was at Comerica Park today as he threw out the first pitch. But it wasn’t all about baseball for the Detroiter. Rose is raising money for the Jalen Rose Leadership Academy, a charter school opening this fall on the Northwest side of Detroit. He’s auctioning off one of the last remaining 1969 Dodge Chargers from “The Dukes of Hazzard” TV show on eBay Motors starting May 22 and the proceeds will go to the school. The car is part of his private collection. On Saturday, he talked about the school, Michigan and his fund-raising efforts. Q: How does it feel to be in Detroit to see the Tigers and have the academy starting up this fall? Q: You said Grant Hill agreed to support the school, so obviously you and Grant have had a chance to talk about the comments made in the Fab Five film? Q: What about Michigan sports? A: “I’m very encouraged we’ve got Brady Hoke in the fray. I think he’s really going to bring back that tradition, that passion and that winning spirit that we’re used to. For the basketball program, it was great for us to make it to the tournament this year. It’s unfortunate that we’re going to lose Darius Morris, just like we lost Manny Harris the year before. Q: How hard is it to give up the car?